Developing the sustainable market of residential Mediterranean solid biofuels. On July 13th 2018, CERTH organised the first BIOmasud® pilot audit in Greece at the BioAlten pellet production plant in the framework of the Biomasud Plus project. The scope of the audit was to check whether olive tree pruning pellets could comply with the quality requirements of the revised BIOmasud® Handbook. The production of olive tree pruning pellets is a demonstration activity within the framework of the AGROinLOG (Horizon 2020-Grant Agreement No 727961) focusing on Integrated Biomass Logistics Centres (IBLCs). 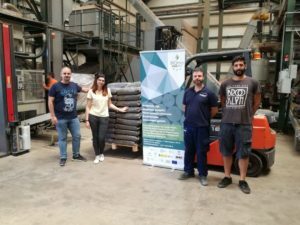 The raw material was collected in spring 2018 in the area of Agios Konstantinos, Fthiotida by the local agricultural cooperative.BioAlten, an ENplus® certified wood pellet producer, was chosen by NUTRIA S.A. (the partner implementing the IBLC concept for the olive oil sector in Greece) for the pilot production of pellets from these olive tree prunings. BioAlten, with the assistance of CERTH, revised its quality management scheme in order to comply with the requirements of the revised BIOmasud® Handbook (V14). The on-site audit was performed at by TÜV Hellas, a subsidiary of TÜV NORD Group. During the audit the documentation, the plant, the biofuel sampling and the sustainability and traceability criteria were checked. The audit did not show any major non-conformities. Once the results from the laboratory tests of a sample chosen by the auditor will be made available and provided they are within the Biomasud quality class specifications for olive tree pruning pellets, the company could obtain the Biomasud® quality label for this type of biofuel. This pilot audit in Greece is the first case where agricultural prunings have been used for production of quality certified biofuels; hence this activity highlights new possibilities to producers who are interested in producing such fuels for the market. The collaboration with AGROinLOG is a good example of synergies achieved between EU funded projects. The produced pellets will also be used in other activities of the AGROinLOG project and validated through combustion tests at relevant facilities. Finally, both TÜV Hellas and BioAlten are interested in the further continuing their cooperation with the BIOmasud® certification scheme, as Inspection / Certification Bodys and fuel producer respectively, even after the end of the Biomasud Plus project. This project has received funding from the European Union's Horizon 2020 research and innovation program under grant agreement No. 691763.